Click on the pictures to enlarge them for a better view. I have fallen in love with this new style of card that I am seeing on Pinterest, especially from the Europeans. I have always loved these bold colors. It is hard to tell from the picture, but the layers are not glued down, only in the middle so the edges are not flat. The bottom picture shows this better. 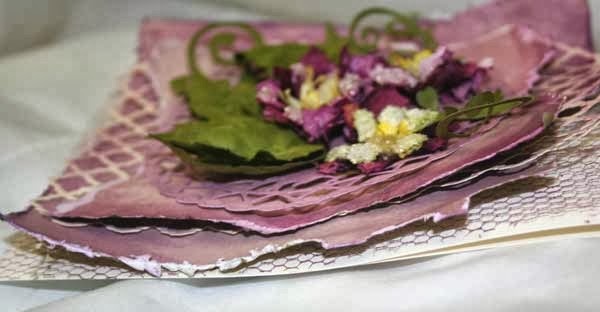 They are also using larger leaves and in layers in Europe The edges of the paper were torn after they were lightly spritzed with water. I find the paper tears easier and look much better. White netting was colored using Distressed Reinkers . This makes such a nice extra texture to the card. 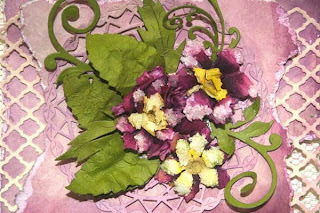 I used crepe paper (again) to make my flowers. I am sooooo in love with this look. I added some White Picket Fence Acrylic Paint on the edges and then sprinkle Diamond Dust on the edges of the flowers which I heated with a heat gun. I wish I hadn't done this last couple of steps, but I didn't have time to redo the flowers. They look much prettier in real life, but the photo doesn't do them justice. What I love about the crepe paper is as I dry it the layers all fluff up and you can't see it with the glitter and paint. I will do more later to show you what I mean. The Poinsettia strip by Cheery Lynn is the die used to cut the flowers. Great die!!!! This might not be a style you love, but I do!!!! Let me know your thoughts. You will have until next Thursday, October 10 morning 6:00 AM EST to link your project. A winner will be chosen from a random drawing for week #40 the winner of the challenge will be announced Friday, October11. 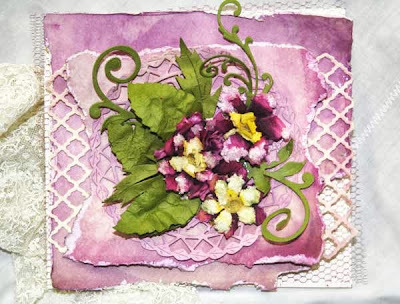 This week's winner will receive a Poppy Stamp Die. The winner will also be entered in the 2013 end of the year $100 gift certificate drawing. 3. Or if you are posting to the SCS gallery, you will need to use a special code to tag your card to the challenge. This week's code is joansgardens, JG1003 and needs to be posted with the challenge. Please enter both on the same line with a comma between as I have shown. I think it is beautiful and I love the colors! Beautiful card Joan!! I agree, some of the European cards are unbelievably beautiful!! Hopefully I do this challenge this week...see you soon!! Colors are stunning Joan, and the card is gorgeous, I love how your flowers came out, have to give it a go. Just loving your cards!!! Emailed you privately, email me when you can, the new hospital stay is now supposedly set up for Monday now at a different hospital, as this past Wednesdays admittance was a failure!. So I should be around over the weekend.